Para ipadama ang namumuo sa dibdib mo! by Cesar Vitangcol of PGMHS I-1 (1965-66). Cesar also designed and created the header image for the website, as well as the posters that are on this page. To see other events that are currently on the go or being planned, click on this. It is really getting close. In a few short days, the anticpated BIG EVENT will be upon us. Activities leading up to the Grand Homecoming are underway as we speak. A number of our classmates have arrived from Australia, Canada and the United States for the reunion. Already in town are Zeny, Natie, Hermie, Teddy R., Teddy B., Ruby, Cesar, Lucy, Lina and Pina. To make things really memorable for them, Fe arranged a special welcome for them at the airport. Click here for arrival pictures. Jimbo, Ruby's husband celebrated his birthday on February 18 with a special lunch at Palaisdaan. It was very well attended by a number of well-wishers, among whom were so many members of Batch 69 it became a pre-reunion reunion. We will post pictures when they become available. On February 19, Marilu and Jay hosted a sumptous dinner for the Balikbayans at their home in Magallanes. And what a dinner it was! Lots of laughter, lots of stories, lots of food. All in all, it was an awesome night. Jay and Marilu and one of their lovely daughters were the perfect hosts. We can not thank them enough. This week-end of February 20 is Fernando's and Cata's turn to host the Balikbayans. A group of them are going up to Baguio to take in the Baguio Flower Festival, which is said to be a very popular attraction in the beautiful mountain city. We'll keep you posted on how the trip went. Seemingly full of energy, the vacationing Balikbayans' schedule for the week leading up to the reunion is jampacked full of activities. Coming up are planned trips to Caliraya, Villa Escudero and Tagaytay as welll as a meet-up at MOA to be hosted by Dan Infante. We're just hoping that with all these activities, our friends will still have the energy come the reunion week-end. 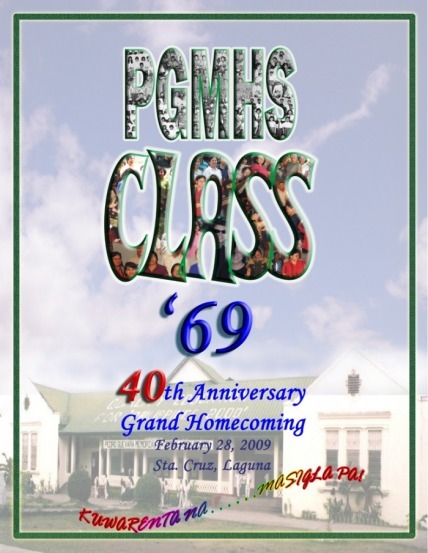 For the reunion week-end, the big kick-off will be the HANDOG sa BAYAN - a Musical Concert presented by PGMHS Class 1969. This concert, which is being sponsored and arranged by Fe, will feature Mayonnaise, a popular Filipino band, the VIVA hot Babes and surprise guests. For some you who may not know, Fe's son, Monty, is a founding member of Mayonnaise. To commemorate our 40th Anniversary Grand Homecoming, Monty has put music to Cesar's poem TAMBULI. To hear this collaboration, you can download the MP3 from here. The big day will be Saturday, February 28. The reunion venue is the Laguna Provincial Cultural Center in Santa Cruz, Laguna (near the Kapitolyo). Assembly is at 7:30AM. For more inside scoop, please visit us at our members-only yahoo e-group. If you are not yet a member, we invite you to join us.